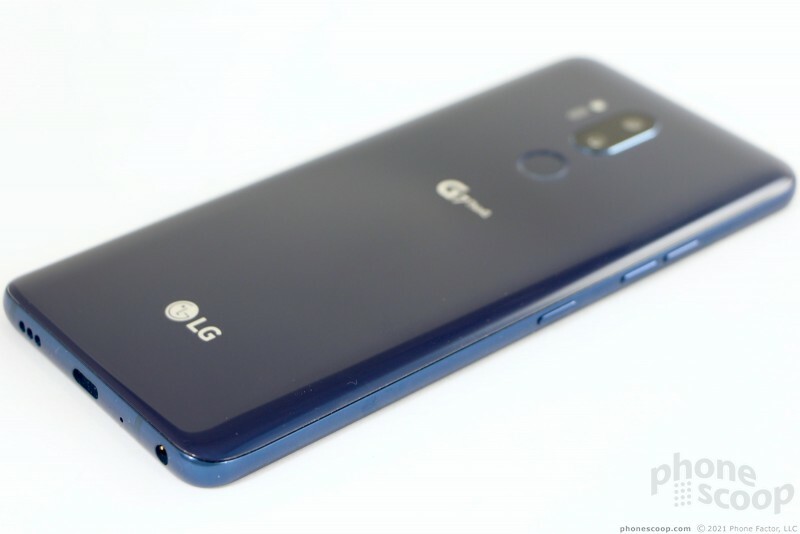 The G7 ThinQ is LG's latest Android flagship phone. It wraps a dual-camera system, top-of-the-line processor, and audiophile components in a metal-and-glass chassis that's sleek, modern, and waterproof. 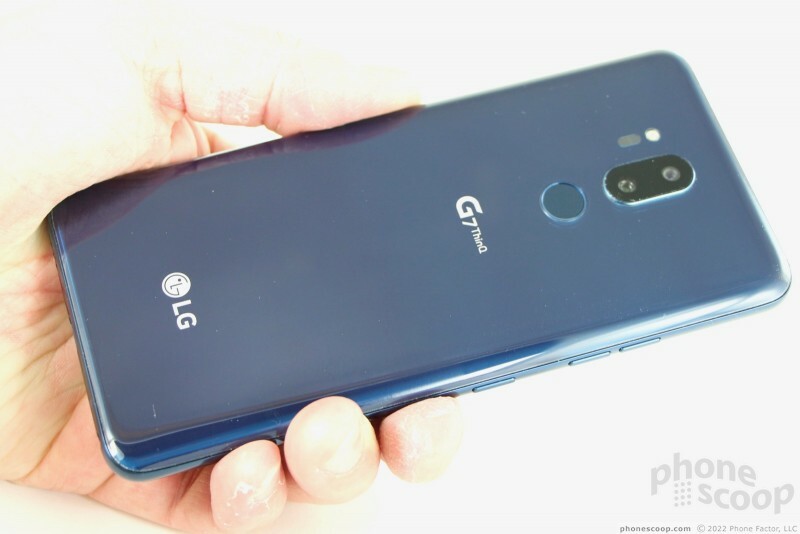 The G7 ThinQ is an alternative to today's Galaxies and iPhones. Find out if it is for you in Phone Scoop's in-depth review. LG deserves your attention. It may not share the splashy cache enjoyed by Apple and Samsung, but the Korean company continues to make excellent phones. 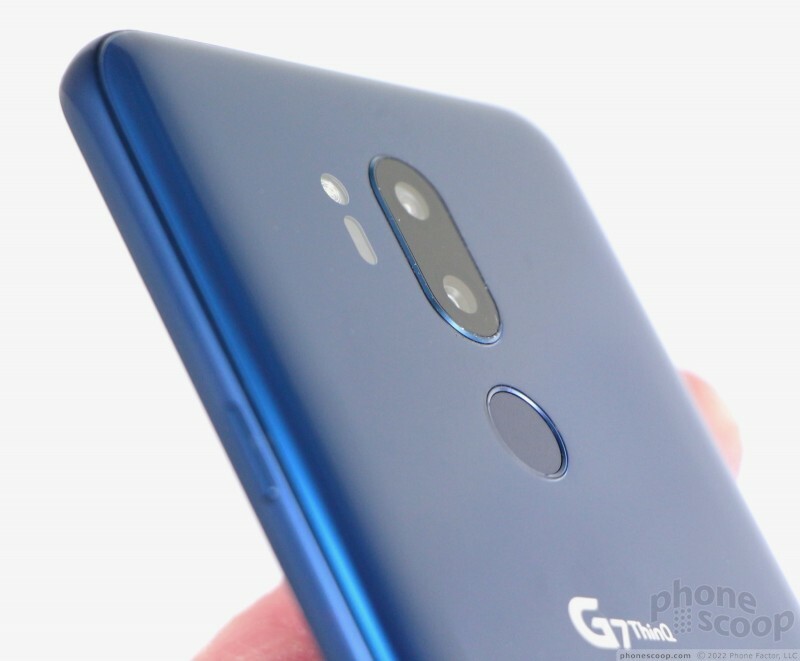 The G7 ThinQ is a metal-and-glass flagship that packs an incredible number of features into a super slim slate. 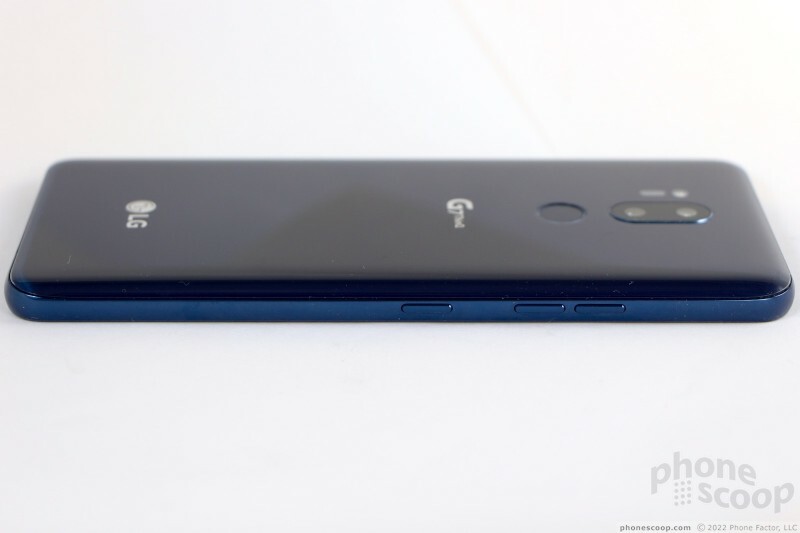 If you're in the market for something a little bit different, the G7 ThinQ has unique features that make it worth your consideration. 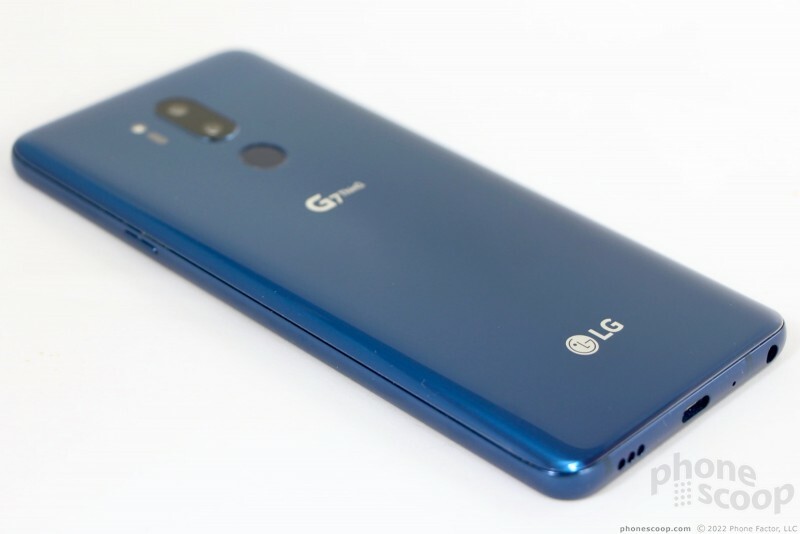 The G7 ThinQ marks the natural evolution of LG's design language. It takes the best elements of last year's G6 (slim profile, chamfered metal frame) and merges them with the best of the V30 (rounded design, high-quality glass). The result is a phone that's easy on the eyes, and easy to hold and use all day, every day. Even so, the phone loses something in process. While the G7 is a fine metal-and-glass entry, it somehow has less personality than its predecessors. Sometimes a little bit of personality goes a long way. The G7 has the tall and narrow shape common to phones with 2:1 screens. It's an attractive hardware design, if not terribly unique. The smooth metal frame wraps around the middle and it's sandwiched between two sculpted pieces of Gorilla Glass 5. Antenna bands are visible on the top and bottom. The phone is conservative and restrained in its shape. The black and silver models don't do too much to stand out from the pack visually, but the blue and red models are stunning. The red has a dotted pattern below the rear glass that's totally unique. LG's flagship is significantly taller than Apple and Samsung's flagships, but is about the same width. At more than 6 inches tall and just under 3 inches wide, the narrow appearance is exaggerated a bit. It's like the Wilt Chamberlain of phones. I found its size and shape to be comfortable. 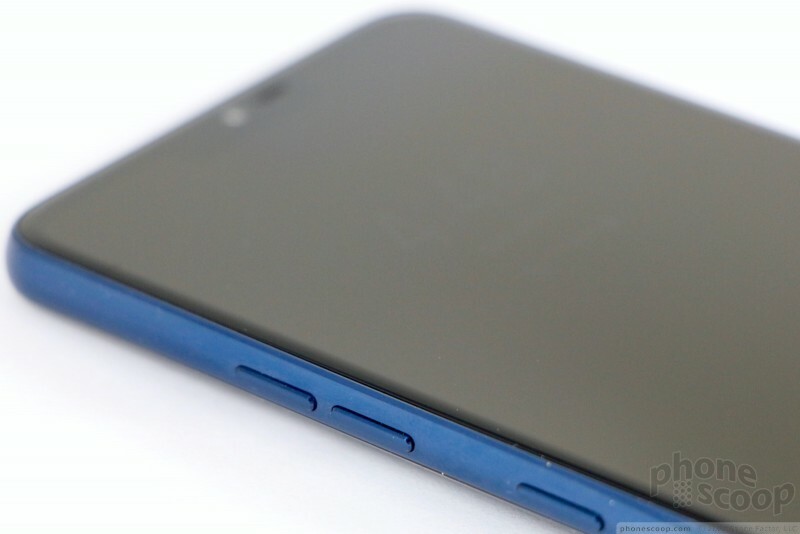 It's 8.2mm thick, which is slim. The phone's polished exterior makes it a bit slippery, and the profile ensures that it glides into pockets and other places effortlessly. It fit in my jeans and shorts pockets no problem. The quality is not in question and the assembly is as fine as any other phone in this class. LG selected solid materials. The metal frame is strong and the glass is … glass. I'm not 100% thrilled with what seems to be some kind of coating on the glass. It feels a bit more like plastic than glass. 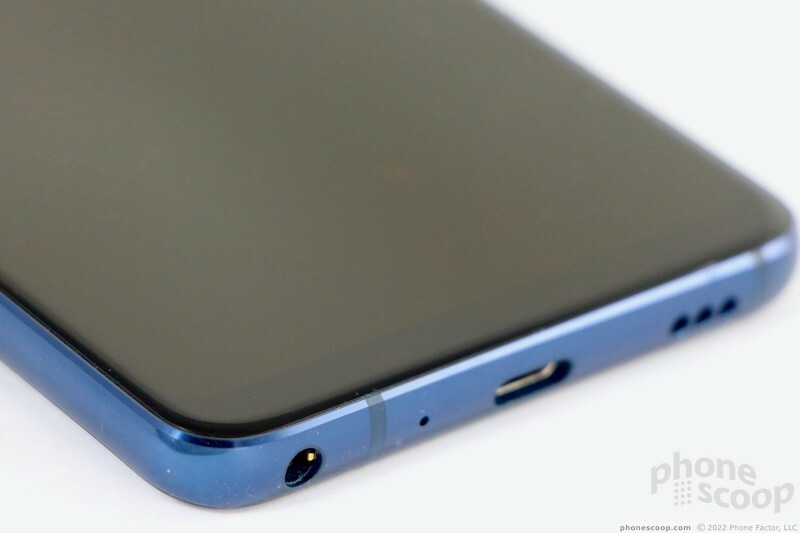 Comparatively, the glass of the Galaxy S9 and P20 Pro feels like actual glass. Still, all the pieces of the G7 are fitted together tightly and there are no uneven seams. The phone is rated IP68 for protection against water and dust. It can handle up to 30 minutes in 1.5 meters of water. I tested it under faucets and in my sink. It came away unscathed. The G7 is not rugged and the glass may break if you drop the phone. The phone's face is all glass and nearly all display. 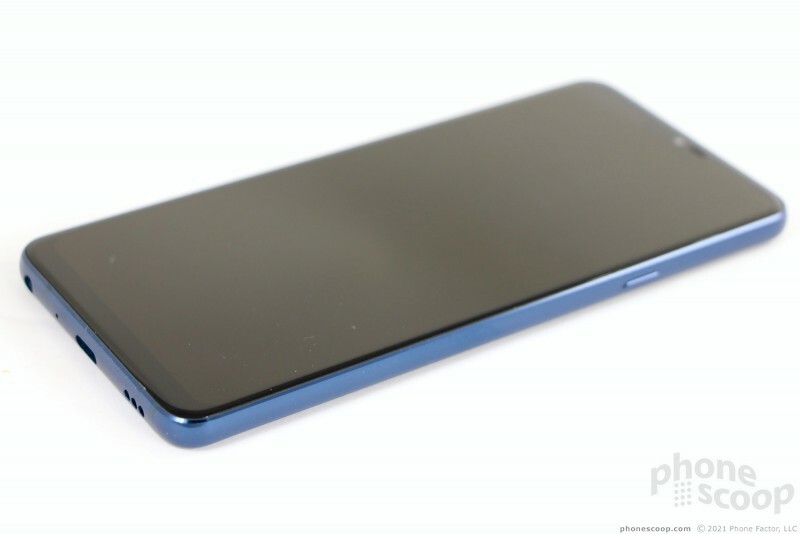 The screen measures 6.1 inches across the diagonal, and that includes the notched area. LG extended the aspect ratio from 18:9 (on the G6 and V30) to something a bit taller on the G7. 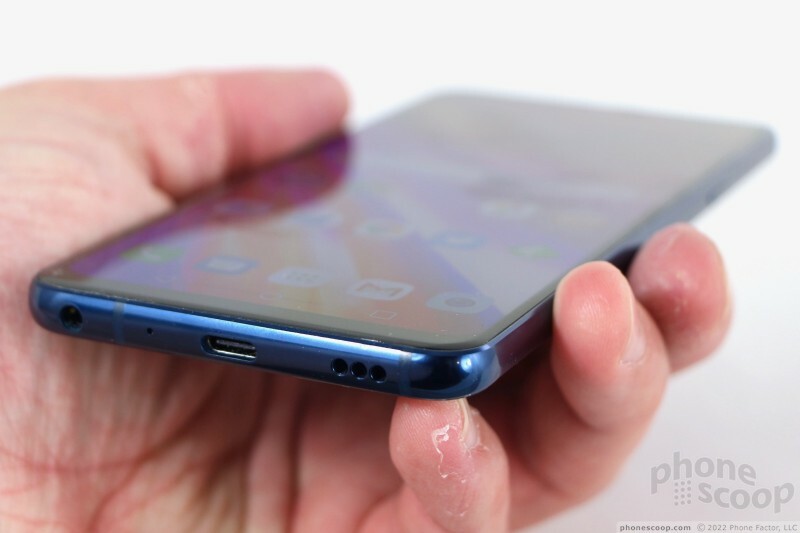 The extra height accommodates the notch. 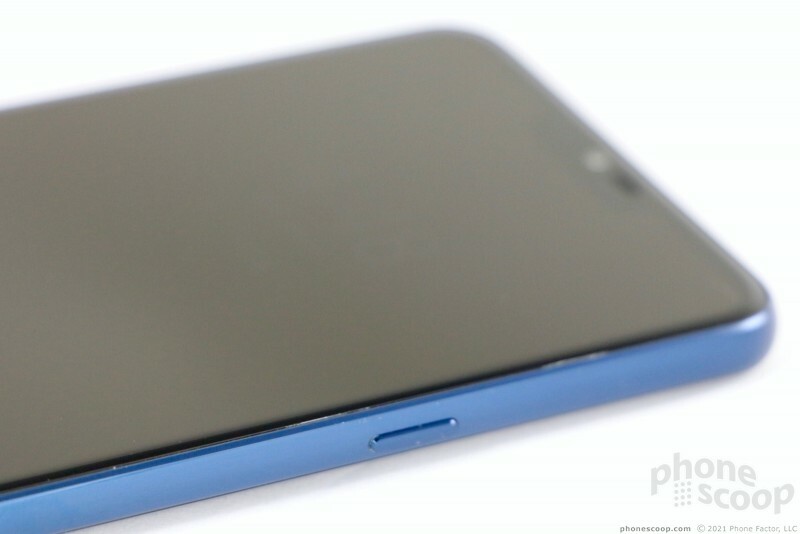 The notch is smaller than the one on the iPhone X. It holds a small earpiece speaker, sensor array, and user-facing camera. There's also an LED indicator light tucked in there. 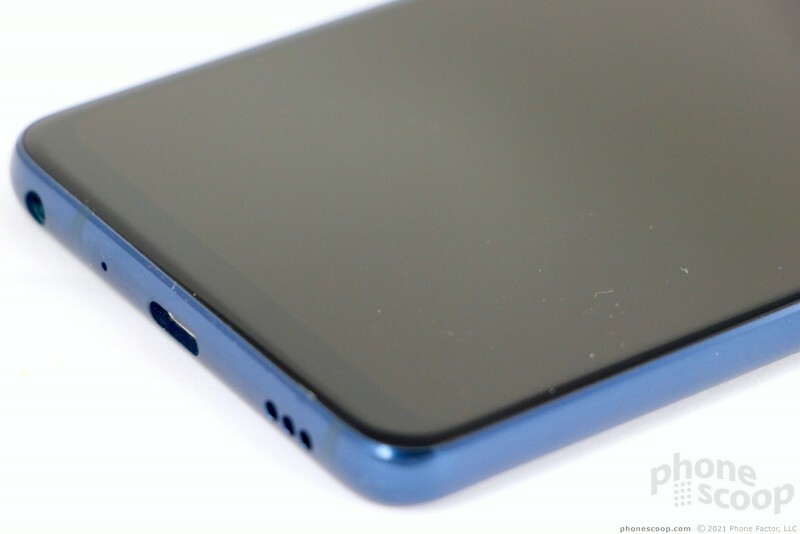 There is a chin below the screen, but it's quite thin. There are no buttons, no controls, no fingerprint readers on the face. The G7's front really is almost all screen. 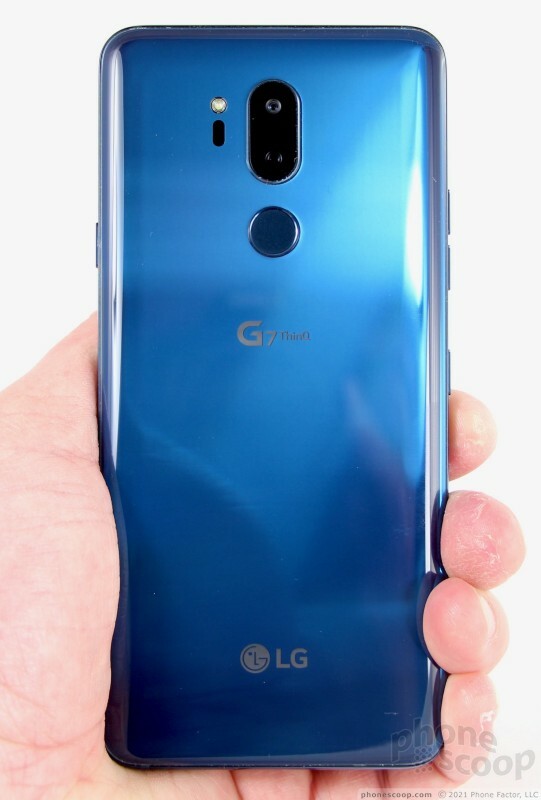 The G7 adds a screen lock button to the right side of the phone. I appreciate this. (It was part of the fingerprint reader on the G6 and V30.) LG says it made this change based on user feedback. The button is located high on the right edge, but it has a nice profile and works perfectly. The individual volume buttons are on the left side of the phone. You'll see a third button on the left, too; it's a dedicated shortcut to the Google Assistant. Physically, these keys all work perfectly. Some will surely groan about the Google Assistant key. Samsung has, since last year, included a dedicated Bixby button on its S series phones. On Samsung's phones the Bixby button can be disabled, but not remapped. On the G7, at least at launch, the Google Assistant button cannot be disabled nor remapped. It will remain a dedicated way to launch Google Assistant. It's faster to hold the button than to say "Hey Google". At least LG is going with the well-regarded Google Assistant and not its own software. Even better, LG has added some custom commands, such as "Take a low-light photo" and such. That's helpful, and LG hinted that something else related to Google Lens will be added soon. On the phone's top surface you'll find the SIM / memory card tray. 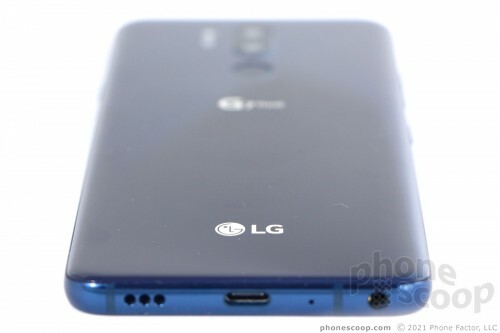 Other than the wicked blue color of our review unit, LG didn't do much to dress up the rear panel of the G7. It's a large piece of glass with slight curves near the outer edges where it meets the metal frame. 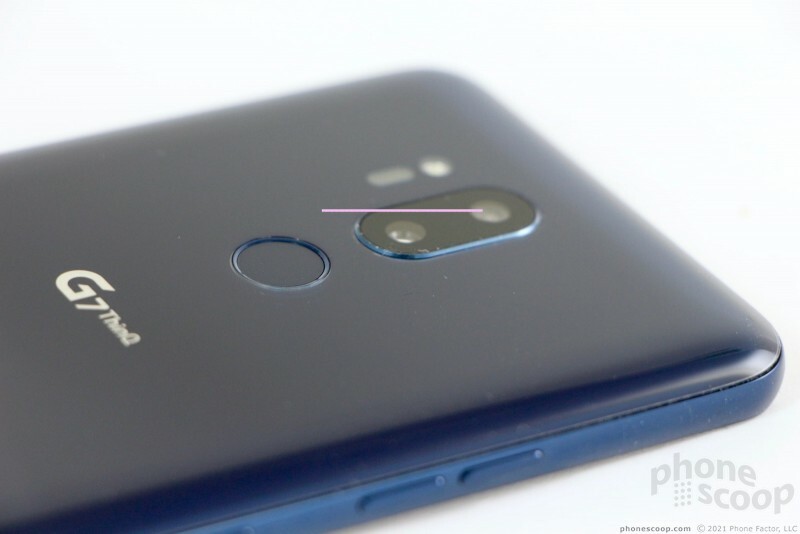 LG did change up the camera and button configuration a bit when compared to the G6/V30. The dual camera module, perched fairly close to the top edge, is arranged vertically. The module has a minimal profile; it barely sticks out from the rest of the rear panel at all. (The iPhone X's camera module is a monstrosity in comparison.) The fingerprint reader is right where I like it to be. 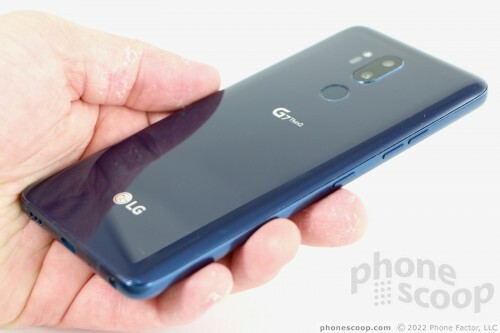 LG said the G7's fingerprint reader does not support extra shortcut features such as scrolling. 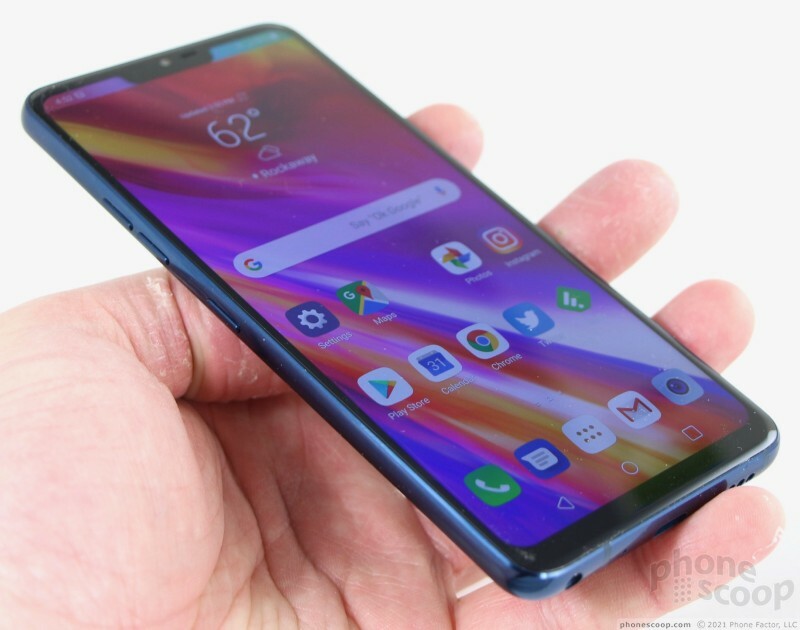 The LG G7 ThinQ is a fine piece of hardware. It's proof that LG can reach the same level of execution as its competitors and churn out a slim, attractive flagship phone. I just wish it had more of its own style. 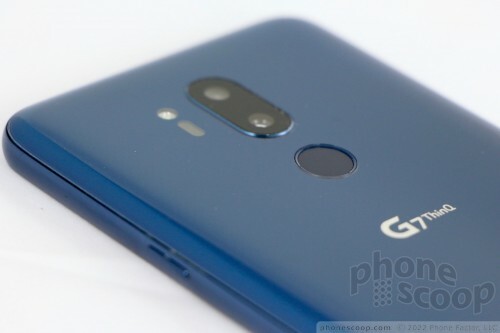 The G7 has a 6.1-inch LCD display. The resolution is 3,120 pixels by 1,440 pixels (~2:1 ratio and quad-HD). Excluding the areas to either side of the notch, it measures 5.94 inches across the diagonal. The LCD has more than enough pixels to ensure everything looks sharp, clean, and free of jagged edges. The clarity of the display is quite impressive. Brightness can be eye-popping. LG is using a Super Bright Display panel, which adds white pixels to the standard RGB mix, for added brightness and efficiency. 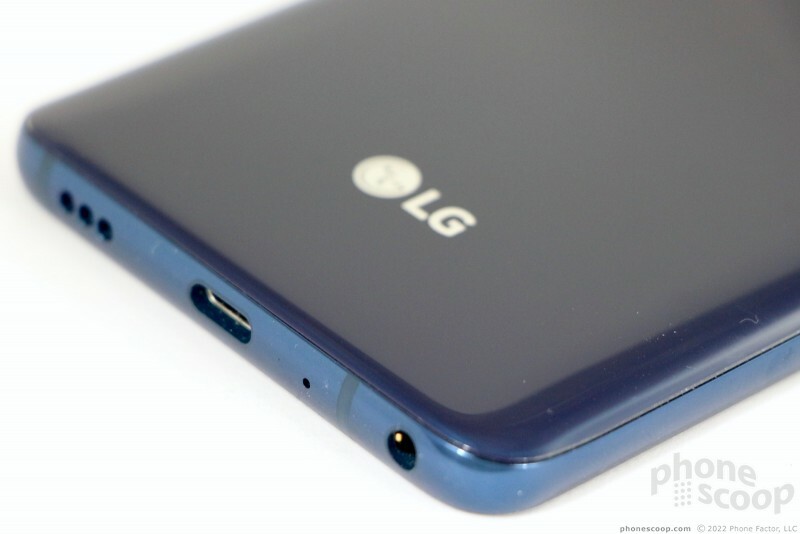 LG goes so far as to claim the phone pushes out 1000 nits. We had a mixed experience. The pre-production units we initially saw were not bright at all, but our review unit (also a pre-production unit) is much better. I was easily able to see everything on the screen (outdoors, under the sun) with the brightness set to 50%, let alone 100%. I had no trouble using the phone outdoors to take pics of my kids' soccer games. The screen supports HDR+ video playback, making it a cinematic powerhouse. Netflix is one of a few apps that support HDR+ on select phones. HDR+ produces even blacker blacks and brighter brights for the ultimate in contrast. The video I watched in HDR+ looked fantastic. 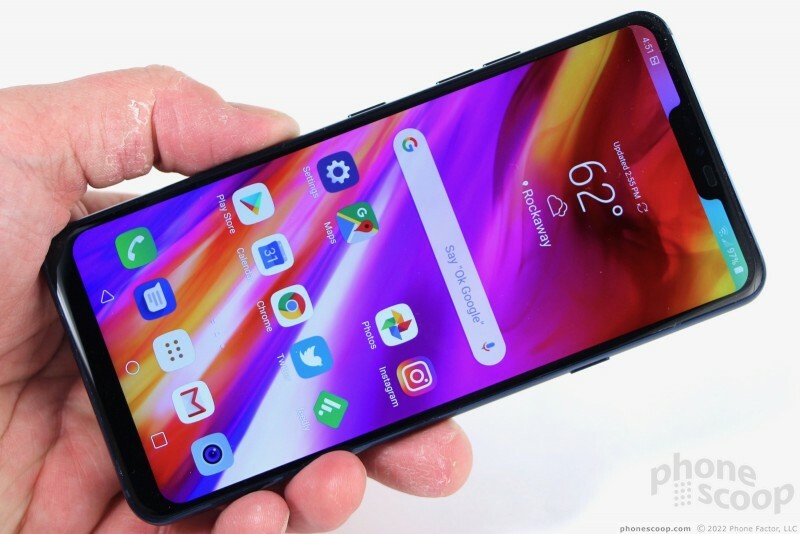 You can take full control over the notch, 'natch, thanks to some software from LG. LG calls this feature "new second screen." 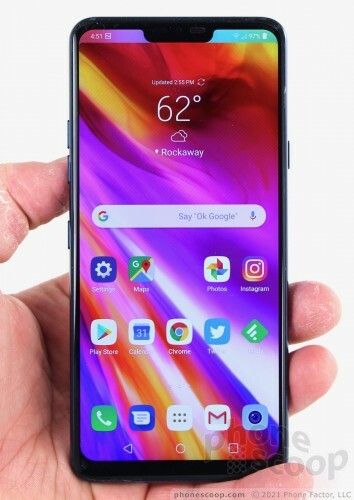 LG allows you to visually erase the notch by turning the pixels to either side black. Because the screen is an LCD (vs. OLED), the ears never fully disappear when in the hidden mode, but it's pretty close in most light. 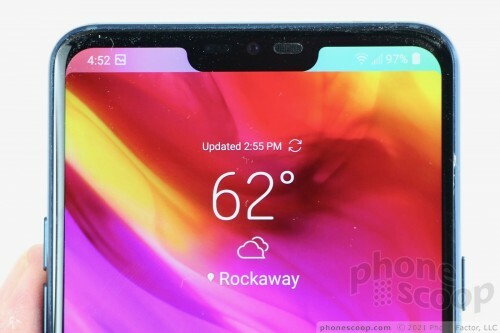 Uniquely, you can also customize the notch ear backgrounds separate from the wallpaper, and even control the rounding of the virtual screen corners. As is now common to high-end phones, you're able to adjust color tones of the whole screen, dial down the resolution, and more, to create the experience you want. 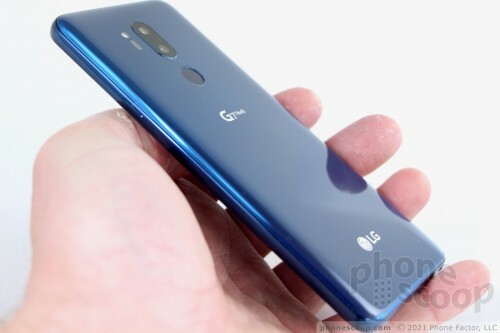 Whether you buy an unlocked or carrier-branded version of the G7, I expect you'll have a good day-to-day experience on today's LTE 4G networks. Call quality was very good across all three networks. The speaker produces loud voices and clean tones that are easy to hear in most places. You can set the earpiece to be quite loud, making it usable in outdoor and indoor spaces alike. Those I spoke to via the G7 said I sounded "fine." I appreciated that I was able to set up WiFi Calling on both AT&T and T-Mobile. When I connected calls over WiFi to other AT&T or T-Mobile subscribers, there was a clear improvement in clarity and crispness. WiFi Calling didn't work on Verizon, though it's possible Verizon's branded variant will offer that service. WiFi Calling quality was great. LG is calling the speaker on the bottom of the G7 a Boombox, which it claims is 39% louder than any other phone. LG is taking advantage of the phone's sealed interior to create a resonance chamber to help amplify sound. The result is an incredibly loud speaker that pushed a huge amount of air. The phone easily fills a small room with speakerphone calls or rich music. Calls sounded excellent via speaker, and music came across as well balanced and clean. I sampled some R&B, rock, pop, and jazz and it all sounded good. 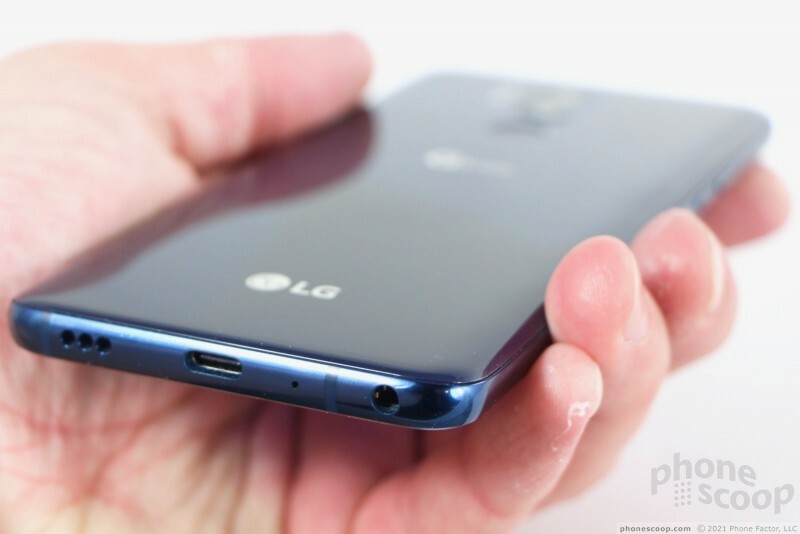 Like other high-end LG phones, the G7 carries over a quad-DAC chip for high-end sound. The phone has dedicated circuitry for use with headphones or when plugged directly into a speaker or amplifier. There's no question this gives the phone a certain amount of appeal to audiophiles. The advanced controls for managing the EQ curve, the sound stage, and the R/L sound balance all work flawlessly. You'll get the best results when listening to lossless audio through high-end headphones. It sounds fantastic. The G7 has a 3,000mAh battery, which feels a bit small to me. There's no question the G7 outlasts the Galaxy S9, which also has a 3,000mAh battery. I pushed the phone hard over several days of testing and found it reached the end of the day with about 20% power to spare. (I was sure to set the brightness to "auto" mode, I kept the screen resolution set all the way up, and ensured that all the radios were being put to use.) The phone does fine — it got me through the day — but it didn't impress me. LG gave the G7 extra tools to help manage battery life. It has a normal mode, an extended mode, and a maximum mode. The latter two can be tweaked to control how severely they cramp down performance. The G7 also allows you to fine-tune how much power individual apps are allowed to use, such as running in the background. 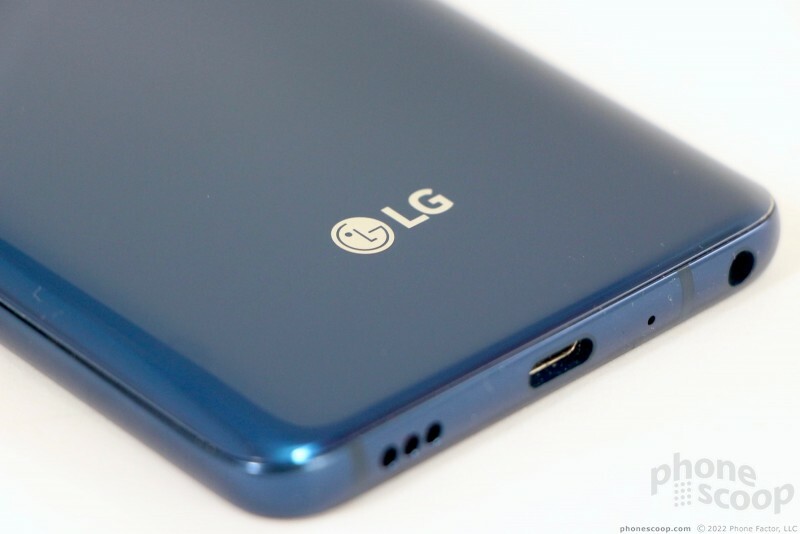 The G7 supports Quick Charge 3.0 through its USB-C port. Thanks to the included fast charger, the G7 will power up quickly when needed. I found the battery often jumped up by 25% in just 15 minutes. It also supports both major wireless charging standards, which means it is compatible with most wireless charging pads. I tested it on a Qi-based pad and it worked fine. In fact, it charged up rapidly via the wireless Mophie Stream Pad+. The phone has all the radios expected to appear in a modern phone, including FM (thanks NextRadio!). The G7's Bluetooth radio did the trick. I paired it with a range of accessories, including headsets, speakers, and PCs. The phone maintained solid connections with each and reconnected easily when turned on. Music sounded excellent over stereo headphones, and voice calls sounded very, very good via my car's hands-free system. The GPS radio worked flawlessly with Google Maps for search and navigation. It pinpointed me within seconds, to about 10 feet. The NFC radio supports pairing with select Bluetooth accessories in addition to mobile payment services such as Google Pay. It worked as expected. LG's update to its flagship phone keeps the design mostly the same while making strides where it really counts: under the hood. This year's phone is slim, powerful, and loud thanks to its metal-and-glass design, Snapdragon 845 processor and AI Camera, and massively loud speaker. Google today updated its Project Fi service in order to make it a better option for families. The service now allows parents to add children under the age of 13 to Project Fi group plans using the Family Link tool.